1. Preheat a barbecue (or griddle pan) until smoking hot. Meanwhile, slice the aubergines into 2cm-thick rings and put in a large bowl. Pour over the oil, sprinkle with the salt and plenty of freshly ground black pepper, and mix well. 2. In a small bowl, cover the saffron with 2 tsp just-boiled water, then pour it over the mayonnaise. Add the garlic and lemon juice, and mix to combine. Put the onion in a bowl of iced water to crisp up. 3. Cook the aubergine on the barbecue or griddle until well-browned and soft all the way through (about 5-7 minutes each side). Set aside until ready to serve. 4. 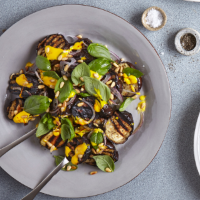 Arrange the grilled aubergine on a serving plate. Blob with saffron mayonnaise and top with the drained red onion, basil and pine nuts. Drizzle with a splash of olive oil and serve.